This week's Muster is chock full of information and events so be sure to read it from top to bottom. You'll find details about a MI sponsored forum on "Medicare for All" and our General Membership meeting, both happening next week. This Muster also shines a spotlight on our election team, describing their work to support congressional races and the help that they need; highlights a meeting that the Climate team is having with the Environmental Voter Project; and provides resources to help you keep up-to-date with the RussiaGate investigation. Enjoy! Resist! and Remember to come to our General Membership meeting on Oct 5th! As of press time, it appears that the Senate will not be voting on the Graham-Cassidy Healthcare bill before the Sept.30th deadline because there aren't enough votes to pass it. Thank you for all your hard work in helping to "Kill the Bill." The Republicans are planning to be back with a new Healthcare bill after they tackle taxes, so rest up, take a moment to thank our Senators for their tireless efforts to defeat this bill, and come to our Healthcare forum next week to find out what's next. On Monday, October 2nd, we're thrilled to be holding a Healthcare Forum in conjunction with Harvard Medicine Indivisible who has helped us line up a distinguished panel of experts to discuss this timely and important issue. Our speakers include William Hsiao, Professor of Economics at the Harvard School of Public Health; Alan Meyers, Founding Member of Physicians for a National Health Program; and Don Berwick, Former Administrator of the Center for Medicare and Medicaid Services. Please bring your questions and join us for a lively discussion from 7-9pm at the First Parish Church, 7 Harrington Road, Lexington. Admission is free and but please RSVP here. Our new State Senator Cindy Friedman will be speaking at our fall General Membership meeting which will be held on Thursday, October 5th at the Lexington Community Center. We'll be having a social hour from 5:30 - 6:30pm, then Senator Friedman will speak about her priorities and the issues important to our teams. After Senator Friedman, we will hear an update from all of our teams on their latest activities and upcoming plans. Please join us and bring a friend! As we are going into high gear for 2018, MI Elections has picked candidates to support and we are actively recruiting for our "action teams." Do you Facebook or Tweet? Sign up for our Social Media team. Our Research team will be doing opposition research on incumbents. The Fundraising team will be organizing events similar to the "Bagels with Mikie" and the Regina Bateson parties held earlier this year, as well as facilitating online donations. We also have Postcarding, Texting, and Phone-banking teams. Finally, we need a graphics team! Do you know Photoshop? Put it to use electing a democrat to the House. These are not huge time commitments and can mostly be done on your own schedule. Please sign up with our Elections Team Volunteer Form. We have researchers already creating dossiers on the incumbents and the districts for use in our social media, fundraising and other campaign efforts. Graphics/Web: Do you photoshop? We need you to help gather images and make memes. Can you fill one of these roles? Yes, you can! Click here to sign up as an Action Team Leader or Member. Want to hear more about the commitment? Contact one of us to get the specifics and hear how we will support you as a leader. It's an exciting one including a Skype session with James Thompson, candidate for KS-04. Everyone is welcome! Remember Jim Thompson? He almost took Mike Pompeo's seat in the special election earlier in the year. He came within six points in a district that was normally +20! He's running again in 2018 and will be talking about the race. Additionally, we'll give updates on the 2018 work already underway. The elections team is hosting Chrissy Houlahan, Candidate for US House for PA 6. Chrissy is endorsed by Seth Moulton, the DCCC, and Emily's List. She is also one of the four candidates the elections team has selected for our support. Come meet her and contribute to the effort. For more information about the event, email the elections team: elections@minutemanindivisible.org. 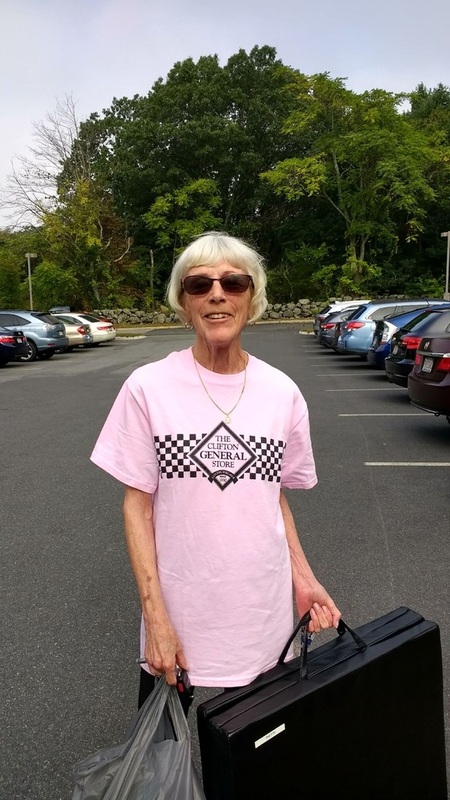 For more about Chrissy Houlahan check out the Emily's List writeup. Want to build out the bench of Democratic office holders? Ascend PAC is hosting an event in Boston to raise money for ascending Democratic candidates for local offices (at the state and local level, across the country). Think of it as a seed firm for Democratic office holders, with the goal of building the bench of Democrats nationwide. 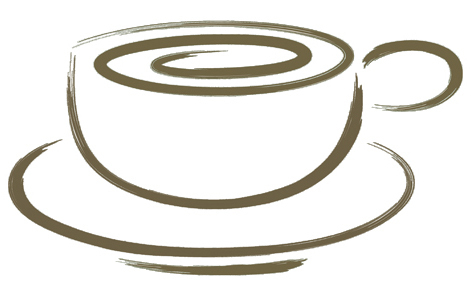 Ascend is holding an event in Boston on Tuesday October 3rd, 60 State Street at the Sterlings office, 6-8PM. Boston City Council President Michele Wu will be their special guest. For more information see https://www.ascendpac.com or email organizer David Byrd. The Climate/Environment team is hosting the field director from the Environmental Voter Project, an organization that recognizes that many people who support environmental protection don't vote and is mobilizing to change that. Come to our team meeting this Thursday, Sept 28th at 7:30 in the Learning Center at Cary Memorial Library and learn how we might be able to help them out. Ezra Levin was in town on Sept 18-19 and had a meeting to touch base with group leaders. 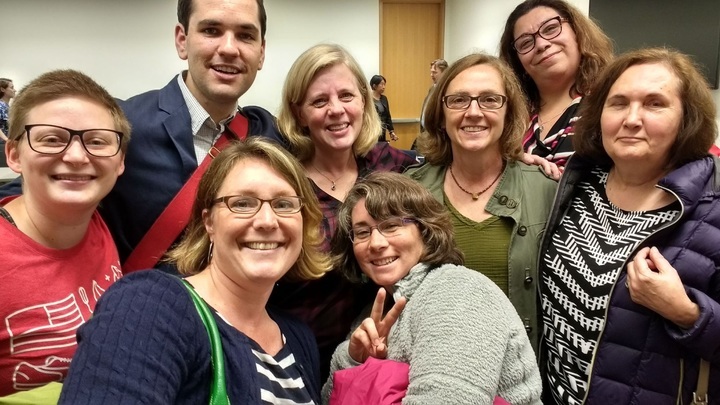 There were approximately 20 people in the room, including representatives from Indivisible groups in Acton, Carlisle, Jamaica Plain, Somerville, Lexington, Andover, Arlington, Somerville, and more. After introductions, Ezra provided an overview of "what's happening" at Indivisible. He discussed the growth of IG and their need to hire people in order to move the organization forward. Currently, there is the national organization and 6000 groups with nothing in-between! IG recognizes the challenges of this situation and is trying to provide an intermediate layer and more communication. Ezra then went on to discuss the priorities going forward. Clearly, at that point, the top priority was healthcare. Ezra stressed the use of the blue state dialer that people in MA can use to call progressives in red states to facilitate a conversation with their senator. IG also contacted statewide Indivisible leaders in 6 key states to help them resist Graham/Cassidy and held special FB live events to disseminate information. Going forward, there will be FB live events every Monday at 8:30 ET to provide important information to members. Finally, there are two new initiatives coming out of IG: Regional Indivisible Institutes and a targeted program for the 2018 elections. Stay tuned for more information! Representative Jay Kaufman’s award winning public policy forum, “OPEN HOUSE,” kicks off its 23rd season with a return to the civic engagement series, “Democracy Demands Engagement.” This first forum of the fall, “Democracy Demands Engagement V: Taking Stock,” is a culmination of the series that took place in the spring. Mark your calendars to explore this challenging territory. RSVP by emailing brad.mullen@mahouse.gov. 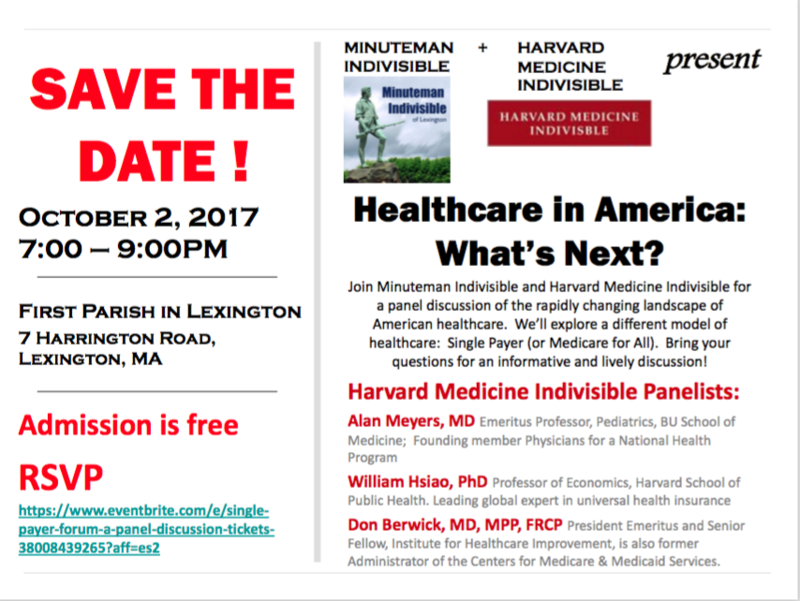 MI has joined forces with Harvard Medicine Indivisible to offer a forum on Single Payer Healthcare. This forum will cover what Single Payer Healthcare is, what are the advantages, and how do we get there from here. This conference is for Indivisible members across the state of Massachusetts. As a follow-on to the June conference, this will be a full day session with specialized skills development workshops as well as networking opportunities. The goal is to make us all more connected and effective in our activism. There will be a special focus on preparing for the 2018 election cycle, just around the corner. Stay tuned for more details. Join us as we participate in a Skype call with Jim Thompson, who came close to pulling off an upset in the special election in Kansas CD04 last spring, and who is running again for the same seat in 2018. The field director of the Environmental Voter Project will be joining us to talk about his organization and how we might get involved. There are many environmental organizations already in the Boston area and we are hoping to spend this fall finding ways to connect and help organizations that are already doing good work. Join us for writing postcards and chatting as well! Join us as we continue the fight against Trumpcare and explore ways we can help improve our existing healthcare system. We mentioned it earlier, but it bears repeating. Your efforts in calling our Senators and calling or texting progressive voters in key states killed the Graham-Cassidy bill! The Republicans plan to be back with a new healthcare bill, so in addition to thanking you, we want to pass along this advice from Patty, a member of our Healthcare team: "It's easy" to text to Protect Our Care! 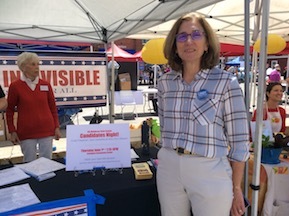 She used the MoveOn text tool described in last week's Muster to text 500 people in 3 hours and still had energy left to work out at the Community Center! The EPA Science Advisory Board exists to provide objective scientific advice to the EPA. A House Republican bill threatens to turn the Board into a tool for industry. HR1431, which passed in the House on March 30, 2017 and is now in the Senate Committee on Environment and Public Works, would allow industry scientists with financial conflicts to serve, while barring university scientists who have received EPA grants. It also creates new procedures that tilt the Board toward commercial interests. Email your MoC to encourage opposition to this bill. Sample letter here. 1) An interactive timeline from billmoyers.com with all the latest information and a interactive form. The information is also searchable by name in case there's one player that you are particularly following. 2) A new organization dedicated to investigating Russia. The Committee to Investigate Russia is a nonprofit, non-partisan resource provided to help Americans recognize and understand the gravity of Russia’s continuing attacks on our democracy. All relevant information is aggregated in one place to provide context and allow users to see the full picture of what Russia has done and will continue to do unless we start paying closer attention. Check out their slogan - For generations, people have fought to protect democracy. Now it is our turn - and their impressive advisory board. Trump has announced that he plans to eliminate the DACA program and yank the American Dream from 800,000 young immigrants who are living in the U.S. lawfully. Congress can prevent this. Ask your representative and senators to co-sponsor S.1615 in the Senate and H.R. 3591 in the House to permanently protect these young Americans and take their future out of Trump’s hands. Also request that they insist that the DREAM Act be included in all must-pass legislation. More info and sample call scripts here. When health care, workers' rights, housing and educational equity, and climate action are being attacked on the national level by President Trump and Congressional Republicans, it’s time to push a bigger, bolder, and more progressive agenda. And when the rights of immigrants, people of color, women, the LGBTQ community, and the poor are being attacked, it’s time to fight back and expand those rights in Massachusetts. And when voting rights are being attacked, it’s time to make voting more accessible here in Massachusetts. Check out the Progressive Massachusetts Legislative Agenda. As we've mentioned before, time and time again we get asked "Our Members of Congress are doing what we want them to do. What can we in MA do?" Our current answer is "call the Governor"! He has a seat at the table so let's call him. You can reach Governor Baker at 617-725-4005. This week, thank him for his participation in a bipartisan effort to improve the existing ACA law and for speaking out against the unpresidential comments about players in the NFL.